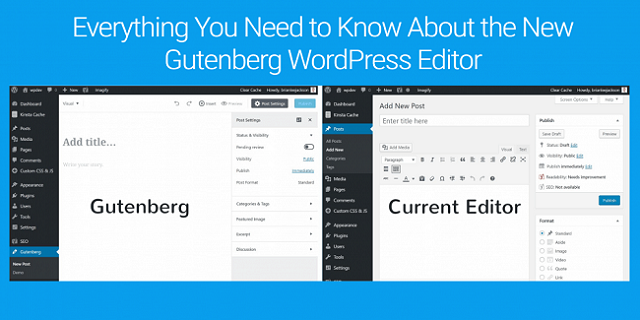 The Gutenberg WordPress Editor is undoubtedly one of the most awaited updates of WordPress. After all, with this new editorial system, the platform endeavors to make WordPress enjoyable for the users. Named after Johannes Gutenberg, the inventor of the printing press, there is a lot of anticipation surrounding the release, especially the functionality of the editor. In this article, we will look at the pros and cons of the Gutenberg Editor. Currently, WordPress offers a What You See Is What You Get (WYSIWYG) visual editor which uses shortcodes and HTML and has been the standard for years. While users are comfortable and happy with it, they also desire a change in the way they publish content. Further, over the years of evolution of the internet, content block style of writing has gained popularity with users. The Gutenberg editor is a content block style editor which is still in the development phase. However, the developers have launched a plugin with essential features to help people get familiar with it and offer suggestions for development. The editor allows the creation of easy content blocks. Hence, developers can create easy paths for themes which support content block sites. The support is more straightforward as compared to the visual editors currently being used in WordPress. The benefit – reduced load time of the website. The editor will be compatible with all themes – the ones that have an inbuilt content block and the ones that don’t. There will be no need for any additional installations for themes without an option for a content builder. There are many content block plugins available in WordPress. However, they don’t work efficiently on all devices. Gutenberg editor ensures that the site performs optimally on all devices. Further, you can also edit your posts and pages using a mobile phone. The users will need to adapt to the change as it might seem complicated, especially for beginners who haven’t worked with page-builders before. For any editor, meta-boxes are an integral part. However, currently, Gutenberg only supports the meta-boxes of Yoast SEO. The support looks partial but is expected to develop further. Despite the responsive design, there seems to be no support for responsive columns yet. Also, ensuring that the thousands of plugins and themes work with Gutenberg might be a challenge. The Gutenberg Editor is currently in its beta phase and available as a plugin in the WordPress Plugin Directory. You need to be running WordPress version 4.8 to be able to use it. Exercise caution before using it as it is still under development. It is good to see that WordPress is still evolving and offering features that make the process of posting your content online easy and efficient. However, to be able to benefit from these features, it is essential to have a solid WordPress hosting plan supporting your site. A good host can ensure that your WordPress core, plugins, and themes are automatically updated, the WP-Database is always optimized, and regular backups are taken so that you can focus more time and attention to creating a better user experience using the Gutenberg Editor without worrying about the management and maintenance of your site. Have you tried the Gutenberg Editor yet? If yes, do share your experience with us in the comments below.